Today I’ve got a long to-do list. It mostly involves cleaning the house from top to bottom. You know that type of frantic crazy cleaning you do when you have family coming over? Well, the family is coming, and I’ve got a ton of straightening and cleaning still left to do. Along with the cleaning, I want to work on menu plans too, so I have the ingredients here at home to cook all of our meals. Since it’s summer, and I want to fill our days with simple pleasures like lounging by the pool, going to the springs or laying out on the beach, I’m going to keep the menu plan as simple as possible. 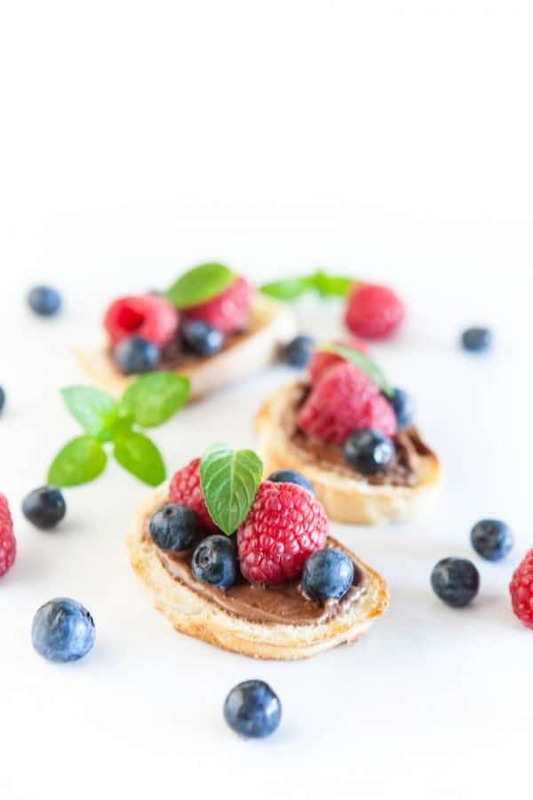 I’ve bought a bunch of fresh fruit and vegetables for the long weekend, and plan on making quick and easy meals like this little Nutella Berry Breakfast Bruschetta. This breakfast bruschetta is super simple. I just started with slicing and toasting a fresh baguette. 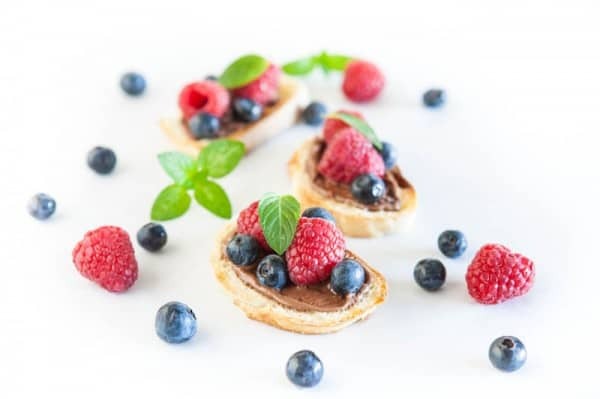 Then I slathered on the Nutella and topped the toasts with fresh berries and mist leaves. Serve with fresh juice, a steamy cappuccino and breakfast is done. Nutella® hazelnut spread is a happy start to every day! It’s so versatile and can be enjoyed on so many things like whole-wheat toast, waffles, pancakes, croissants, bagels, English Muffins, graham crackers, crepes, fruits and more. You’re only limited by your imagination! On the Nutella® Tumblr page, you can share pictures of you enjoy Nutella, get recipes and participate in spreading the happy! There’s nothing quite like Nutella®. Its uniquely delicious taste comes from roasted hazelnuts, skim milk and cocoa. And did you know that Nutella is gluten free and has no artificial colors or preservatives? And have you heard of Nutella&Go!? It’s one of my favorite snacks! It’s a single-serve convenient snack pack with Nutella and breadsticks for dipping anytime, anywhere! Nutella can be found grocery stores, warehouse clubs and mass merchandisers, and is generally found near the peanut butter and sweet spreads section. Nutella&Go can usually be found at the front of the store- end caps or at register. Nutella® hazelnut spread is a happy start to every day! 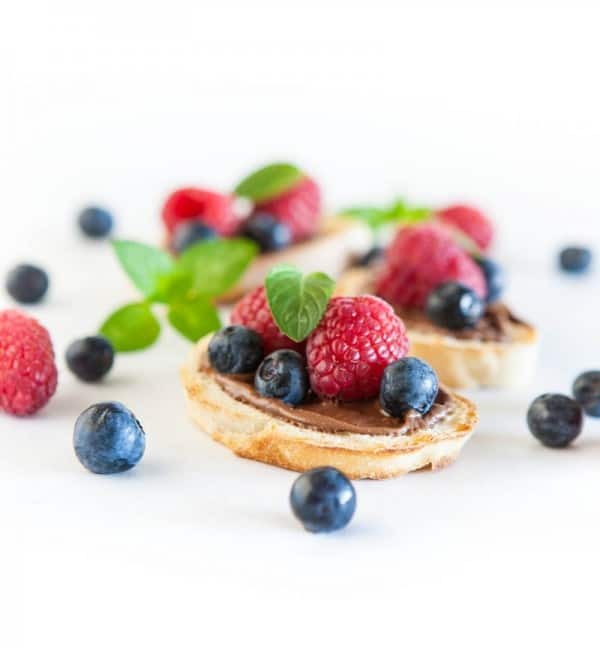 Pick up a jar of Nutella in the spreads aisle and enjoy it with whole wheat toast, waffles, pancakes, strawberries, bananas and many other foods. Nutella. Spread the Happy™. Don’t forget to connect with Nutella on Facebook, Twitter, Instagram and Pinterest! Toast baguette slices. Spread Nutella over toasted bread. Arrange fresh fruits on toast. Garnish with mint leaves and serve. Compensation was provided by the makers of Nutella via Mode Media. The opinions expressed herein are those of the author and are not indicative of the opinions or positions of Nutella. I’m kinda in love with this. Okay not kinda, I am. This is music to my ears… Love the idea of breakfast bruschetta!